Sunshine’s Catering, LLC was inspired by Sarah’s (aka Sunshine) food sensitivities and passion for nutrition and cooking. 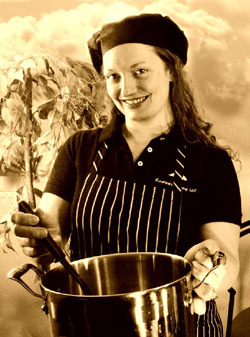 Sarah is a non-traditional professional chef and has a unique combination of skills, education and experience. The nutrition, time and love that goes into Sunshine’s Homemade brand recipes sets them apart from all other brands. Sarah’s recipe for Sunshine’s Homemade Sweet & Spicy BBQ Sauce is tangy like southern style BBQ sauce with a sweet and spicy taste. Once you taste this sauce you will see why people have gone crazy over the recipe. It tastes amazing on all chicken, pulled beef or pork, fish tacos, BBQ chicken pizza, burgers and more. You won’t find another sauce like it! Don’t cook without it. Try it and you’ll be hooked – one jar of sauce is never enough! Sunshine uses only natural ingredients, with no preservatives, no MSG, no gluten, and no corn syrup. Only the best goes into Sunshine’s Homemade Sweet & Spicy BBQ Sauce which is canned the old fashioned way in authentic Ball brand wide mouth mason jars for preserved flavor and a long lasting fresh taste. The recipe is a family gourmet recipe, made from scratch the old fashioned way. The sauce is a perfect blend of spices and with a healthier recipe than most store brands. The sauce caramelizes when baked, cooked or grilled. It Is famous for being the best sauce many have tasted – not too spicy and not too sweet. Use it for dipping fried foods, spread on your favorite cuts of meat or put on the last 15-20 minutes of grilling, pour it on your favorite baked foods or in the crock-pot for a unique savory blend of sweet and spicy. Let Sunshine’s Homemade Sweet & Spicy BBQ Sauce do all the work for a delicious meal that tastes like you spent hours!